I never saw the sign, as we entered Lithuania; although I spotted it on the way back out several days later. It was one of those regular road signs, a sheet of stamped metal that bid drivers welcome to the country. No larger than the signs that announced a new town. Driving south from Latvia into Lithuania, I only realised we’d arrived when the wheels beneath me fell silent. The rattle of gravel against the underside of the car, the rutted, unfinished roads, suddenly gave way to smooth tarmac; it was an immediate indication that there was something very different between these two countries. As I suspect might be the case for many who have never visited the Baltics, before I went there for myself I hadn’t pictured any great different between Latvia and Lithuania. Culturally, geographically and linguistically, I imagined them to be relatively similar – two small, cold, former Soviet republics. Beyond that, I had absolutely no idea what to expect from them. While the shadow of the Soviet Union might still hang heavy over Latvia however, in Lithuania it appears, at first glance, to have been all but scrubbed from the history books. In Latvia I had explored a Soviet ghost town in the forest; another time, I stumbled quite by accident across an abandoned Soviet military academy. Even in Riga, the Latvian capital, one district of the city – known locally as ‘Little Russia’ – is towered over by a Stalinist-style skyscraper embossed with a large hammer-and-sickle motif. Such sights were a rare thing in Lithuania however, where just this year the last Soviet monuments have been carted away from their posts overlooking the capital, Vilnius. Perhaps it’s little surprise when you look at the ethnic makeup of the two nations. Where Latvia’s population is something like 25% ethnic Russian (and more like 80-90%, in the eastern city of Daugavpils), in Lithuania the figure is closer to 5%. In place of lingering Soviet ghosts, the Lithuanians seem quick to have filled the cultural void created after half a century of socialism with a resurgence of their own folk traditions. It feels like everywhere you look in Lithuania, there are wood carvings. Goblins, witches, gnomes and trolls, a menagerie of mythical beings wrought out of twisted boughs; ubiquitous wooden figures that appear, quite often, to have strolled straight out of the forests that surround them in all directions. If such symbols of a purer past stand for a decanonization of the Soviet years, then the famous Hill of Crosses is the very masterstroke of that movement: a memorial not just to resistance, but moreover to carrying on as if the USSR had never happened to Lithuania at all. The Hill of Crosses – in Lithuanian, ‘Kryžių Kalnas’ – is one of those places I had heard about long before I ever visited it. That didn’t do much to prepare me, though; in reality the site is far larger, more complex than any of the images I’d seen could possibly convey. Situated 12 km north of the industrial city of Šiauliai in the north of Lithuania, the location itself is nothing extraordinary. Little more than a mound, the small hill rises out of a flat landscape of cattle fields, forests and grass. I saw it first from the main road: cruising along that ever-so-smooth tarmac, watching as the occasional wood-beamed farmhouse blurred past against a backdrop of autumnal forest colours… and there, in the distance, the thickets suddenly parted to reveal a yellow-brown hump a couple of fields over from the road, sunlight glinting golden on the fragile crust of metal shapes that covered it. We turned off the road, followed the signs and parked nearby – alongside a market stall, where pilgrims could purchase their own crosses to add to the collection. From the empty car park through an underpass, beneath the road and then we saw it up ahead: the Hill of Crosses, glowing in the last light of day. With the sun just minutes above the horizon, the warm light caught the crosses sideways to cast long, oblique shadows across the yellowing grass. Sunlight on our backs, we followed the paving stones that brought us to the foot of the hill; where a tangle of crosses spilled down and around, into the surrounding fields, a knot so tight and dense that it became a mass of frantic arms and masts, only a few rising high enough above the chaos to maintain their form in silhouette. There can be no way of guessing the number of crosses that adorn the hill. In 2006, it was reported to be past 100,000; today the estimates range from 200,000 up to half a million. During my own brief visit, I saw another five or six crosses added to the forest. Some are giants, as much as 3m tall and dangling Christ-figures greater than human size. Others are no larger than your fingernail. Nobody seems to know exactly when the Hill of Crosses began, although the local practice of raising cross memorials likely dates back as early as the 14th century. Šiauliai, the nearby city, was founded in 1236 AD and would later be occupied by the Germanic Catholic order of Teutonic Knights; their practice of battling pagans under the banner of a black cross became rooted in medieval Lithuanian identity, and offers an early correlate for the cross symbolism which would carry that nationalism forward. Between 1772 and 1795 the Polish-Lithuanian Commonwealth was partitioned by the Russian Empire, the Austrian Empire and Prussia. Lithuania was annexed by Russia, who brought with them Orthodox Christianity… and a Russian tsar as the head of the church. Amongst the Lithuanians, a traditionally Catholic culture, this religious and political oppression would be met with defiance. Following the model for revolutions in France and Belgium, in 1831 the Poles and Lithuanians organised an uprising against despotic Russian rule. The rebellion was crushed; but in a mark of solidarity, Lithuanians in the area of Šiauliai raised Catholic crosses for the fallen on the hill of the demolished Domantai Fort. Another uprising, in 1863, claimed further casualties. In many cases there were no bodies left to be buried, and so some crosses stood memorial in place of graves – others were simply symbols of defiance against Russian Orthodoxy and its tsar-pope. By 1895 the hill featured a total of some 150 crosses. Spurred by rumours of prayers answered and miraculous healings, the hill became a popular destination for Catholic pilgrimages. The tradition developed that visitors would bring with them new crosses to plant in the soil, or to hang from the beams of larger installations. While the hill grew only gradually under Russian orthodox rule, in 1918 it was returned to an independent Republic of Lithuania… and the Hill of Crosses would begin to host feast days and celebrations as Catholicism was restored as the official religion of state. In 1914 there were 200 crosses; by 1940, twice that number. The hill endured the 1941-44 Nazi occupation of Lithuania, although its existence would later prove problematic for the Soviets. Having first established their Lithuanian Soviet Socialist Republic here in 1940, the Red Army of the USSR returned in 1944. They chased the German Army out of the Baltics while cities such as Šiauliai suffered serious damage in the crossfire. This newly imposed Soviet identity brought with it state atheism – which would prove as poor a fit for Lithuania as had the evangelical Orthodoxy of the previous Russian Empire (it’s no coincidence that in 1990 Lithuania was the first state to break away from the USSR). As a symbol of defiance though, the Hill of Crosses became more popular than ever during the era of the Lithuanian SSR. During those 50 years the Soviets did their best to manage the hill, to contain the spread of pilgrims’ memorials, but as fast as they could pull down crosses new ones would pop up to replace them. On several occasions, they sent in heavy machinery to tackle the problem: in 1963 the hill was levelled by bulldozers, and approximately 5,000 crosses were removed. The wooden memorials were burnt while metal crosses were melted down, to be fed back into the Soviet industrial complex. Nevertheless, the hill slowly returned – stone by stone, cross by cross. In 1971 the bulldozers were redeployed, and again, in 1975, to destroy another 1,200 crosses that had sprouted from the rubble. In increasingly desperate efforts to suppress this symbolic rebellion, the Soviets resorted to extreme measures. They buried the site beneath rubble and sewage; and it was rumoured that KGB agents were stationed around the hill at night, to ward off pilgrims approaching from the surrounding forest. Supposedly the Soviets even considered redirecting the nearby Kulvė River, to drown the hill beneath an artificial lake. But the pilgrimage site endured, and ultimately, it would outlive the Soviet Union itself. By the time Lithuania gained its independence in 1990, there were somewhere in the region of 55,000 crosses arranged upon the hill. 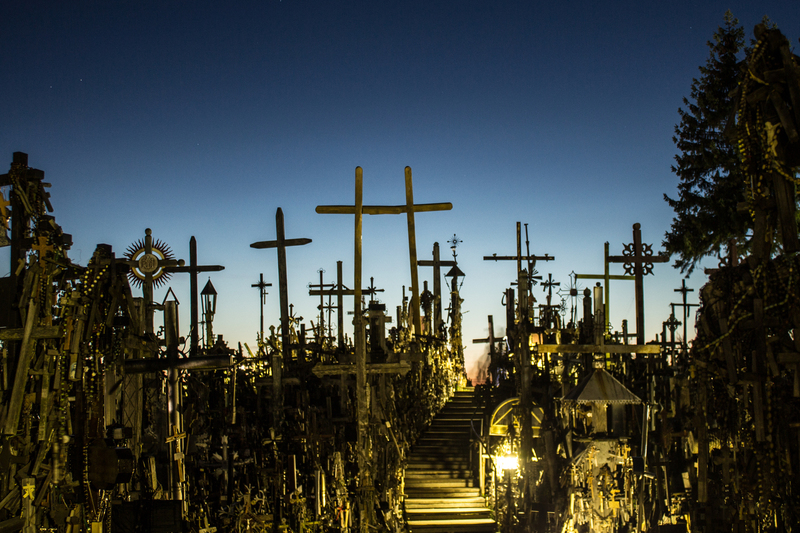 The Hill of Crosses emerged from the smoking ruins of the socialist experiment as a robust and battle-hardened symbol, an enduring icon of Lithuania’s unconquerable national character. Day gave way to night, the sky’s colours faded and as a full moon rose up over the hill I felt the place transform. If the myriad forms and symbols had felt chaotic before, that chaos was now muted as my surroundings receded into darkness; and instead of studying a maddening multitude of shapes, spotlights drew focus instead to singular forms that rose out of the contours of the night. These lamps had lain all but completely hidden during the day, nondescript glass cylinders tucked away amongst the tumbled carvings – but now, triggered by nightfall, they began to shine white light up on the crosses, redefining the topography of the hill. Somewhere around the back of the mound, I found myself on a path that meandered through crosses painted in military colours for dead airmen; past carved wooden churches complete with pews and altars, around a cross daubed in glitter and teddy bears, engraved with a prayer for a child lost at an early age. A figure emerged from the void ahead, moving towards me down the narrow path. I couldn’t make it out at first, blinded by the brightness from a nearby lamp; but as I passed the spotlight and my shadow danced on ahead of me, I was able to see the man who approached. He was young, walking slowly amidst the crosses with a ceramic coffee mug in one hand. He wore shorts and sandals, despite the autumnal chill; steam rose in wisps from his cup. He didn’t acknowledge me as he passed by, seemingly engrossed instead in his study of the shapes and scripts around us. Soon, he was lost again into the night. Later I passed by a family. The language they spoke sounded like Lithuanian, and as they moved from cross to cross the parents were encouraging their child to read the inscriptions out aloud. I came back to the first crest of the hill after that, where a white plaster effigy of the Virgin Mary stood tall amongst a tide of loose crosses. Here they were piled so high on either side that it was hard to see what stopped them from tumbling back down into the path; it gave the impression of a parted sea. Candles burned at the feet of the Madonna, simple shrines and beads and prayers, while somewhere beneath the mass of wood and metal I could hear music: Beethoven’s 7th Symphony, warped and muffled as if playing on an old cassette deck buried deep within the drift of tiny crosses. The delicate strains of music rose into the air, carried on the incense that burned and drifted around the statue. Elsewhere, I heard an old clock ticking from somewhere beneath the carvings. Visiting the place at night was a surreal, yet beautifully peaceful experience. I can see how it might sound unsettling – a remote hill in a former Soviet state, miles from anywhere and piled with a splintered mass of wooden figures that look down on visitors from all sides – but there was a sanctity about the space, about the narrow walkways weaving in and out of darkness, that gave a feeling rather like entering a cathedral. A hushed reverence hung about the hill, broken only by muffled Beethoven, by rattling beads and the sounds of ducks quacking happily at some invisible stream nearby. For Catholics, the Hill of Crosses has become an important site of pilgrimage. Not only Lithuanians, but from all over the world the faithful travel here to lay their offerings, to raise prayers and even attend mass; at a memorial celebrated as a testament to the endurance of the Catholic church. But while the Catholics might have claimed Kryžių Kalnas as their symbol, I wondered if perhaps the importance of this place was larger than any one denomination could take credit for. The fact that these oppressed Lithuanians chose to practice Catholicism is eclipsed in significance, at least to my mind, by the fact that they simply refused to be denied a choice. Meanwhile the Orthodox icons I saw scattered about the hill, the Jewish stars that peeked out here and there from beneath the rosaries, seemed to reflect a beautiful sentiment of tolerance and union; so that by the time we left the hill behind, late into the night, I could no longer think of the place as a religious site at all… but rather simply as a monument to freedom, and to the defiance of tyranny in all its guises. Darmon Richter is a freelance writer and photographer; an experienced urban explorer and self-confessed dark tourist. He’s also the author of The Bohemian Blog, a site exploring the bizarre, the macabre, and other secret wonders of the world. A MAGNIFICENT AND MOVING EXAMPLE OF SACRIFICE IN SEEK OF FREDOM.